CHAMPAIGN, Ill. — Slavery and racism played their roles in planting beliefs about race and racial difference, but so did medicine, says the author of a new book. Many physicians in pre-Civil War America and the West Indies developed ideas that black bodies were different in basic ways: naturally immune to some diseases, more susceptible to others, more tolerant of pain, in need of specialized care. Some of those ideas have survived to the present day, in both formal research and informal attitudes, according to University of Illinois historyprofessor Rana Hogarth. “Medicalizing Blackness” is published by The University of North Carolina Press. “Medicalizing Blackness” is published by The University of North Carolina Press. Some previous research has suggested that doctors’ ideas about racial difference were driven by the desire to justify slavery, Hogarth said. But she found too many contradictions in that explanation. “I don’t think that slavery was the driving force,” she said. For one thing, slavery didn’t need defending through much of the 1780-1840 time period Hogarth covers. The abolition movement was certainly growing, but for the average slaveholder, “slavery wasn’t going anywhere,” she said. Some of these ideas also conflicted with slaveholders’ interests, Hogarth said. The belief that black people were immune to yellow fever, for instance, may have made them more attractive as slave labor in tropical regions – but it also prompted British governors of several West Indies islands to lobby at one point for arming black troops for the islands’ defenses. At another point, relying on the same belief, Great Britain sent 800 African troops from Sierra Leone to Barbados. Many soon became ill with the disease, though their commander looked for alternative explanations. Slavery also was not served by physicians’ diagnosis of a dirt-eating disease among black slaves, called Cachexia Africana, Hogarth said. It caused them to languish, made them unable to work. Production would suffer as a result, purportedly causing the ruin of some plantations. “It doesn’t make sense as a justification for slavery because it’s a disaster,” Hogarth said. Hogarth also noted that some of those involved in this medical discourse held anti-slavery views, among them Benjamin Rush, a prominent Philadelphia physician. In lectures, he told his students that black people were more tolerant of pain. When a yellow fever epidemic struck the city, he asked black friends to stay behind, thinking they would be immune – then finding they weren’t. As a medical historian, she was also fascinated with how these doctors conducted much of their discourse in a kind of research bubble, continually citing and reinforcing each other. “One respected physician would publish a treatise saying he had observed that Africans do not get yellow fever. Then somebody else would repeat it. Then somebody else. So it became this sort of historical game of telephone,” Hogarth said. Some black people were, in fact, immune to yellow fever, but only if they had been previously exposed in an epidemic and survived, Hogarth said. Physicians at the time were not yet aware of acquired immunity in the modern sense or the genetics involved in susceptibility to certain diseases, making a racial explanation that much more attractive. 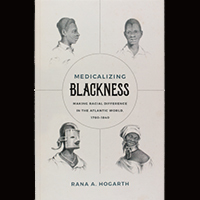 Yet despite advances in medical science and research methods, these ideas of “medicalized blackness” have continued up to the present, Hogarth said. Sickle cell anemia has been described as a black disease, yet it’s caused by factors related to genetic adaptations to malaria in various regions and affects many non-African populations. And a 2016 University of Virginia study found that half of a sample of white medical students and residents held false beliefs about biological differences – such as that black people had thicker skin, blood that coagulated more quickly, and were more tolerant of pain. To reach Rana Hogarth, call 217-300-2402; email rhogarth@illinois.edu. Hogarth’s book “Medicalizing Blackness: Making Racial Difference in the Atlantic World, 1780-1840” was published in October by The University of North Carolina Press.